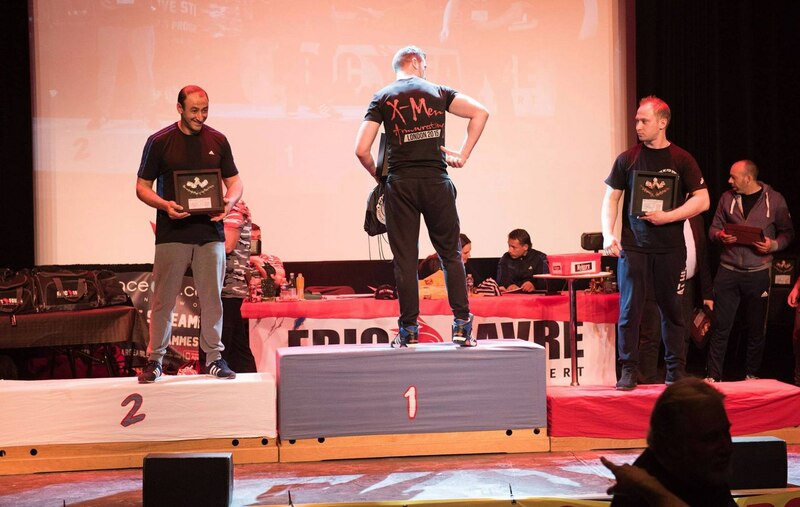 The French Armwrestling National Championship took place on the 11th march 2017 in Drap, France near Nice. There were 100+ participants with at least 10 teams represented. The most interesting fights were in the open category in my opinion, Aymeric Pradines won his category left and right and won the open with both hands, his fight in the finals right hand with Mickael Gattoni was thrilling. In the lighter categories, David Vitry and Christophe Rey did a great job and had some brutal fights in the finals right and left hand. Christophe "THE STING" Rey was in great shape but was weaker on the left hand. The 80 kgs category was great too with great fights, David Diouf is making an enormous return since 2 years now, last year he defeated Jozsef Lovei on the right hand in the finals and this year he won everything and took 3rd place right hand in open category at ~76 kgs bodyweight, 80 kgs category was also marked by the fact that Jozsef Lovei did not competed. 85 kgs category was great, Mickael Bobillo won everything with no suprise, he is a powerful young guy!! 90 kgs category featured some great fights too ! Ciprian Valean took first place right hand and left hand for the first time since Salih Buldukoglu wasn't here this year, it allowed Ciprian to win left hand for the first time. Ciprian vs Salih left hand in the finals is like a "Classic" fight since 2-3 years now. Every year they meet and Salih usually win. 100 kgs category was no suprise, Aymeric Pradines won everyone pretty easily except Mickael Gattoni with whom he had a great fight. +100 kgs was maybe the hardest category with really powerful opponents that are among the top 5 armwrestlers in France, the real clash was between Iago Gvidiani and Dimiti Vizii both hand, it was really close, both athletes are incredibly strong, Dimitri took first place left hand and Iago first place right hand. Alan Barbieris in that category did awesome job too he took second place right hand in less than 2 years armwrestling !! He is one of the most promising athletes in France. As I said earlier Open category was awesome and the trophies were the real big deal everyone wanted to win it. Before the competition Aymeric told me that the hammers (open category trophees) will be his!! And indeed he took two hammers home. David Diouf did a great performance right hand, he took 3rd place, Gregory Schneider took 2nd place left hand winning Dmitri Vizii, it was a big surprise! It was an incredible national championship this year, everyone called it the greatest ever made since there is armwrestling in France. We had a lot of competitors from everywhere in France, almost every team was represented. We had a guest star Mr. David Shead here for refereeing, a quality live stream, and the trophies were the best we had since a long time. It was awesome. I don't know if the team will go to Worlds or Europeans but I’m sure that we will be represented by a French athlete. I believe Aymeric Pradines will compete EAC or WAC.